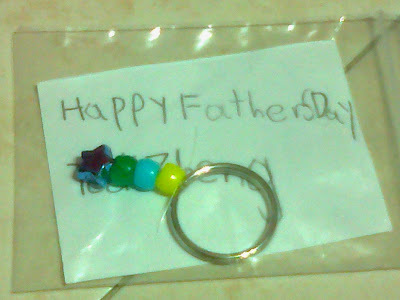 Little DinoEgg's gift to daddy for Father's Day, finally a "decent & useful" gift for daddy ^^, he made this in school. Daddy was clearly very happy with the gift. He keep saying he got nothing from him during the past Fathers' Day. Earlier I whispered into Little DinoEgg's ears, telling him to give a hug to daddy and wish him Happy Father's Day. He was so excited n giggled. Then he tippy-toed into his room (while giggling which obviously gave him away), hide inside the room, peep at daddy (who is sitting at the study table just outside his room), then creep up to him and shouted "SURPRISE! Happy Father's Day, daddy!" follow by a big hug.